You’d need quite the attribution platform to figure out just how much of an impact specific advertising has on the actual political races. But something far simpler than cross-channel attribution -- the most tried and true method of figuring out voter sentiment: polling -- might give us an idea. 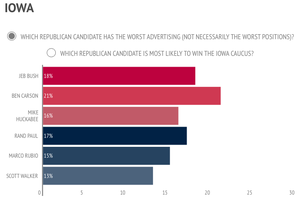 After spending July 2015 and August 2015 targeting Republican voters in the four states with the earliest primary elections -- Iowa, New Hampshire, South Carolina and Nevada -- programmatic ad platform TubeMogul polled the voters with two simple questions: 1) Which Republican candidate has the worst advertising (not necessarily the worst positions)? and 2) Who will win your state’s primary? In three of the four states -- South Carolina, Nevada and New Hampshire -- it didn’t seem to matter if the ads were annoying. In fact, in those three states, Lindsey Graham, Jeb Bush and Donald Trump, respectively, all had “the worst advertising” but are also still most likely to win, per the respondents. The exact implications of this data are not explicit -- it never is with political advertising -- but the relationship between ad sentiment and favorability is easy for any advertiser to understand. Perhaps this data indicates, theorizes TubeMogul, that Walker has his messaging and media mix down (at least in Iowa), while others are still going with the spray and pray approach (which also seems to be working, but is less efficient). To be clear, we don't know if Walker's approach was "targeted" while the others went with "spray and pray" -- it's just a theory. The data does, however, show what the ideal "targeted" campaign would look like for a political advertiser: The candidate would have the least annoying ads (because the ads would be shown to the right people) and the candidate would be among the favorites to win because of (at least in theory) a strong connection with their most valuable targets and a non-damaged relationship with other voters because the candidate did not repeatedly ping those other voters with "annoying" ads. Efficiency is ultimately what could drive more political marketers to audience-targeting technology (i.e., programmatic ad tech). Recent data from Targeted Victory found that roughly 75 cents of every broadcast TV dollar spent on political advertising gets wasted on the wrong voters. Political marketers aren’t ready to fully bite into programmatic yet, but the foundation is clearly there. Recent Borrell figures show that broadcast TV is still the top choice for political advertising, as it’s expected to account for over half (52%) of all political ad dollars spent between now and the 2016 election. Over the next five or so years, however, more of that money will shift toward digital, per Borrell. “With all the breakthroughs and technologies available online, TV is still king for political advertising. In fact 80-85% of the online campaigns we do are just running :15 or :30 second TV ads online to a specific audience,” commented JC Medici, director of political and advocacy at Rocket Fuel. As Medici noted, political advertising is still very much a TV-first operation. Even most of the digital activity, per Medici, is just rehashed TV creative. But he also added that the market “has come a long way … with the ability to run ads against a voter file,” a trend that’s expected to continue in 2016 and beyond. There are a lot of moving parts when it comes to political advertising and voter sentiment. And while a sea change is not going to happen overnight as it relates to reaching voters in new ways, the first ripples are now visible. This post was previously published as an RTBlog.